Mono Print Strappy Cami is rated 5.0 out of 5 by 6. Update your wardrobe with our best-selling printed camisole vest. 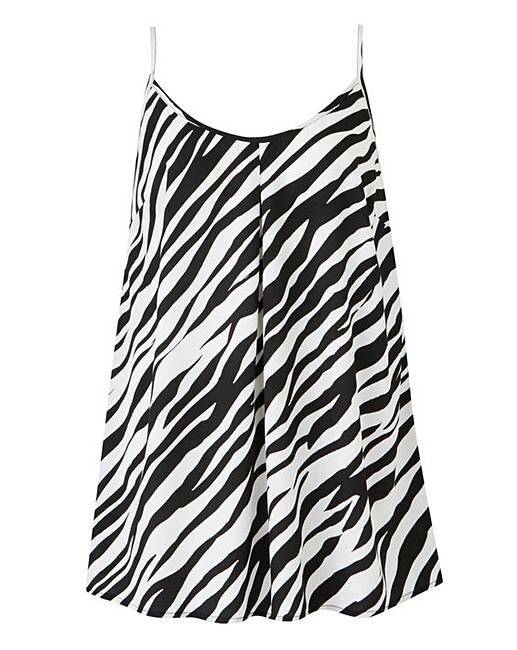 Fashioned from on-trend animal print, this cami is the perfect piece to layer this season. In a longline style with cami straps and a flattering V-neck, pair with jeans and flats for the perfect on-trend look. Rated 5 out of 5 by Chuckie from Lovley I have only tried it on, but its lovley, got it for the summer holidays, it's great. Rated 5 out of 5 by Brinnie from Casual top Great fit. Hides lumps & bumps. Versatile. Great length. Adjustable top. Rated 5 out of 5 by Juliedawn from Good fit Bought this topfor upcoming holidays and its lovely. Nice fit, no clinging. Smart enough for evening or daytime wear. Rated 5 out of 5 by josie from Great fit Yet another nice cami from jdwilliams. Great on its own on a hot day or with a cardi. Recommended.